On October 15th, Bernard Hopkins defends his WBC light heavyweight title against Chad Dawson at the Staples Center in Los Angeles. Earlier that day in England, WBO beltholder Nathan Cleverly takes on Tony Bellew. Jean Pascal is tentatively scheduled to enter the ring again on December 10th. The only blue-chip 175-pounder who seems to have nothing on his itinerary is IBF titlist Tavoris Cloud. 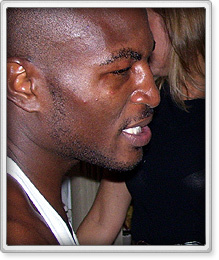 Thus far in 2010, Cloud has fought just once (an eighth round stoppage of Yusaf Mack back on June 25th). This continues a rather disturbing trend with Cloud who, while coming up as a young prospect under the 8 Count Productions banner in Chicago, was given steady work after turning professional in 2004. By 2008, he had earned the top ranking in the IBF and seemed poised for a breakout but since winning the vacant IBF title by soundly defeating Clinton Woods in August of 2009, he has fought just three more times, twice in 2010 and the aforementioned fight with Mack. “I'm having trouble getting fights. I don't know what the problem is and it's been this way ever since I became number one contender back in 2008,” lamented Cloud. The problem for Cloud is that like many other fighters at his level (those who have tasted six-figure paydays and exposure on the premium cable networks), he is stuck between two realms: fight when HBO or Showtime has a slot for you- or don't fight at all. Last December, after defeating Glen Johnson four months earlier, Cloud took an off-TV fight in Miami, Florida, on a card that was financed by Don King, which was a loss-leader for everyone involved. Shows of this nature usually don't end up turning a profit (especially if a casino is not involved) and in this case, Cloud agreed to perform for less than his contracted minimum as a world champion. Contracts in boxing have provisions that state a certain amount boxers get paid as they capture major world title belts or attain appearances on HBO or Showtime. Here, Cloud waived those stipulations in exchange for activity. The still bombastic King who calls Cloud “the best fighter in the world” and says, “I love Tavoris Cloud” is now trying to talk him into going once again from “Boxing After Dark” to fighting in the dark. To King, not doing so is akin to cutting off his nose to spite his face. “He gets himself in a position where he don't think but he's a good guy and I'm going to work with this guy because this guy really comes to fight. He gives the people what they want,” said King. Right now, Cloud is reticent to do what he did last December and he has ditched at least two scheduled meetings with King to discuss these matters in the past month. “That would be correct. He hasn't come in and talk to me,” the promoter confirmed “but that would be the underlying cause there because he's not being talked to. He's got to be able to be explained to and every time you call him, he's out doing something but right now, he should've been training. A fighter must understand that his trade is practicing his trade. Not going out there trying to be a promoter, getting out there and talking to the press, this, that or the other. When you talk to the press, you want to talk about what you want to do, who you gonna be and how you gonna help people, so you gotta be able to educate them to that way of doing and then their physical attributes will be personified when they go out there and do what they're supposed to do and then come back and give back to the community. On November 5th, in staging a show in Hollywood, Florida, King was hoping to put Cloud on that card. Industry sources tell Maxboxing that after making around $150,000(before the usual deductions that boxers go through with their fight purses) he was offered just a fraction of that for this card. As of now, there is no television entity for this show, although it was rumored that Epix would be interested on the basis of Cloud's appearance. Once again, he expects Cloud to come in and see him. So how did the promoter convince Cloud last year to face Fulgencio Zuniga? The hard-hitting man from Tallahassee, Florida is in a tough spot. It's a classic damned-if-you-do, damned-if-you-don't scenario. Cloud feels he's earned the right to be in a higher tax bracket and he's the type of guy that the networks should want to feature because he's a real rugged fighter, the kind that provides a good night of violence dressed up as entertainment. In an era of prizefighters who hide behind their supposed “skills” to continually take the path of least resistance, Cloud is in many ways a throwback. That said, at age 29, he might run the risk of dying on the vine. Some will demonize King (which is par for the course); others will put the onus on Cloud (who is now on his third promoter as he is now facing litigation from Richie Boy Promotions) but this is not a black-and-white issue. They could both be victims of the current state of the boxing business and how it's now operated. Most elite fighters nowadays perform two, maybe three times a calendar year and it's really at the behest of the networks that really compensate them in the form of license fees. Promoters, like King, sign boxers to contracts which have terms that are essentially predicated on the hope (sometimes promise) that an HBO or Showtime will clear space for your fighter. Many times, the minimums in these contracts are only as good as the availability of dates on a network and to lure these fighters in, promoters have to put in these figures, often times not in line with the actual market value of the boxers (Cloud was developing a bit of a following in Chicago while with 8 Count but is now a fighter whose value is solely determined by what a network says). Put out numbers that are more realistic and risk getting outbid by another company that can secure dates much more easily. “That is the double-edged sword,” said King. Cloud does not have a home base, say, like a Tomasz Adamek who was built into an attraction by Main Events in Newark, New Jersey and could make a nice living with or without HBO and therefore can't live off the live gate. King, for all his prowess in the past, has seen better days. He no longer has the influence he did with either network and the number of cards he puts on seems to dwindle every year. In the past, when he had cash cows like a Tyson, Julio Cesar Chavez and Felix Trinidad, he could leverage those entities into exclusive deals (as he did with Showtime when he represented Tyson) or worst-case scenario, stick his other fighters onto their pay-per-view cards to keep them active and provide them exposure. What rankles King (and many others) is that while the desultory Dawson was invested into heavily by HBO, Cloud is still largely on the outside looking in. But again, it's HBO or any network’s prerogative to make bad decisions. Perhaps this is another example of the overreliance of everyone in the industry on the premium cable networks. Let's be honest; if Cloud were represented by one Al Haymon, this story wouldn't be written. Agendas became more important than the actual fights and fighters on the airwaves. What's taking place here- and with many other boxers- is really a systemic breakdown where no one is completely to blame but nobody is blameless. And we'll see Cloud next year, right? Nobody can get off the track and make it so entertaining quite like King when asked certain questions.